for about 30 seconds to soften. Using a fork, mash the ricotta cheese and the almond paste together, until well combined. Fold in ½ cup of the thawed Wild Blueberries, reserving any juice in the bowl for the glaze. If needed, leave the remaining ¼ cup wild blueberries to thaw to make juice for the glaze. You will need about 3 Tablespoons. Roll the dough into a rectangle and lay onto a parchment lined baking sheet. Using kitchen shears, cut an equal number of 3-inch strips down each side of the dough, leaving about 3 inches down the middle for the filling, and 2 inches at the top and bottom of the dough (see image.) 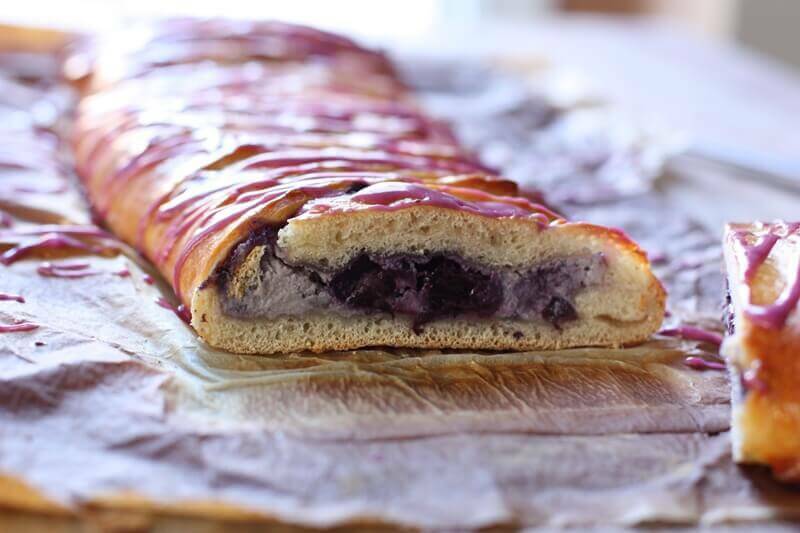 Spread the filling down the center of the dough and top with a few extra Wild Blueberries. Fold the top and bottom flaps down over the filling. Begin braiding by gently lifting the top dough strip diagonally across the filling on each side, continuing all the way down the length of the dough. Give the bread a quick egg wash and bake for 16 minutes or until crust is golden brown. 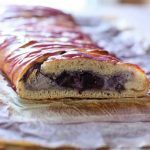 While the bread is baking, whisk together the confectioners’ sugar, reserved Wild Blueberry juice, and almond extract in a small bowl. When bread is finished baking and completely cooled, drizzle the glaze over the bread and serve.